Picture shot in my back yard with a cannon macro lens 100mm. Actually I'm interested in the lens and am at present working with a friends one. Shot with one light source, I've lit the subject from the right hand side whilst I positioned myself on the left. Converted from raw, adjust slightly the colours and 10% sharpening of the focoused part. Fitting title, I'm confused, since only small portions of the image are clear. Strawberries, cream, and cake? I'd be interested in seeing a clearer outtake. Nice title and nice abstract! the title is an oxymoron : yes. the photo fits as well : not to sure how this si clearly confusing. 7 for having an oxymoron title since most people didnt. Fits the title, all right! What is it? 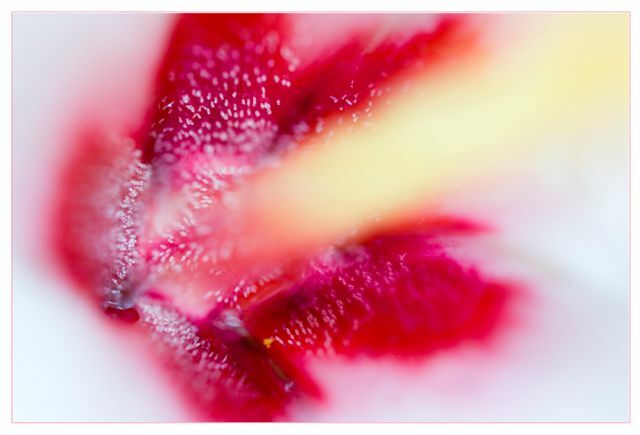 I like how the DOF blurs the foreground flower piece (stamen? can't remember the flower parts right now) into a nearly translucent state. This works well as an abstract and the color is fun to look at. Well, at least this got longer than a 2 second look from me anyway. Good luck in the challenge. I don't know that I like this as a picture, but the title gives it a very distinct feeling that fits the challenge. I can't explain it, but as art I like it. I dont know what this is.. but it looks nice. This is wonderful, the title suits it perfectly. Beautiful - confusing, but beautiful. Proudly hosted by Sargasso Networks. Current Server Time: 04/18/2019 04:55:08 PM EDT.